After the primary vote on one judicial seat, Margaret Bisignani-Moyle took the Democratic nomination and Frank Castellano took the Republican spot. Both are long-time assistant district attorneys with little civil litigation experience during their careers of fighting crime. 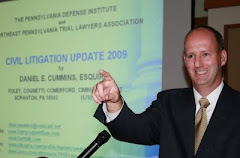 President Judge Harhut has not indicated what types of cases the new Lackawanna County Judge will focus on, but it is clear that another civil court judge is needed as the trial date backlog is up to a year to 18 months to get a trial date in this county. In Luzerne County 17 candidates were running for two spots. District Magistrate William Amesbury took the top spot on the Democratic side with Tina Polachek-Gartley coming in second. On the Republican side, Richard Hughes took the top spot and the cross-filed William Amesbury came in second. One local news article has indicated that Judge Amesbury's dual nomination effectively matches Attorney Hughes against Attorney Gartley in the November 3 general election. Dickinson Law School grad, Jennifer Harlacher Sibum, secured both the Democratic and Republican spots in the primary for Monroe County Judge. Attorney Russell Shurtlef secured both the Democratic and Republican top spots in the primary for common pleas court judge in Wyoming/Sullivan County, taking over the spot long and held by retiring from the bench Judge Brendan Vanston.